Blair Ghent left a good job in Toronto to return home to rural Newfoundland. 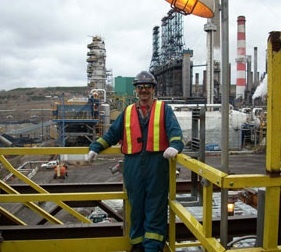 But work is hard to come by on the island, and soon he found himself joining thousands of unemployed Newfoundlanders commuting 3,000 miles to the oil sands fields of Alberta. Pam Pardy and Blair Ghent left good jobs in Toronto to return home to rural Newfoundland. They thought the quality of life would be better there for their son Brody. But work is hard to come by on the island, and soon Blair found himself joining thousands of unemployed Newfoundlanders commuting 3,000 miles to the oil sands fields of Alberta. The fields raise big questions about the planet’s energy future. But for Blair and Pam, they raise more immediate questions – like who will help Brody with his homework, and whether their marriage will survive the time apart.